We all know that a good life begins with a good education. That’s why we’re working to prepare children to enter school ready to learn, to build strong reading skills by third grade, to remain socially and academically engaged in school and to graduate on-time and college- or workforce-ready. 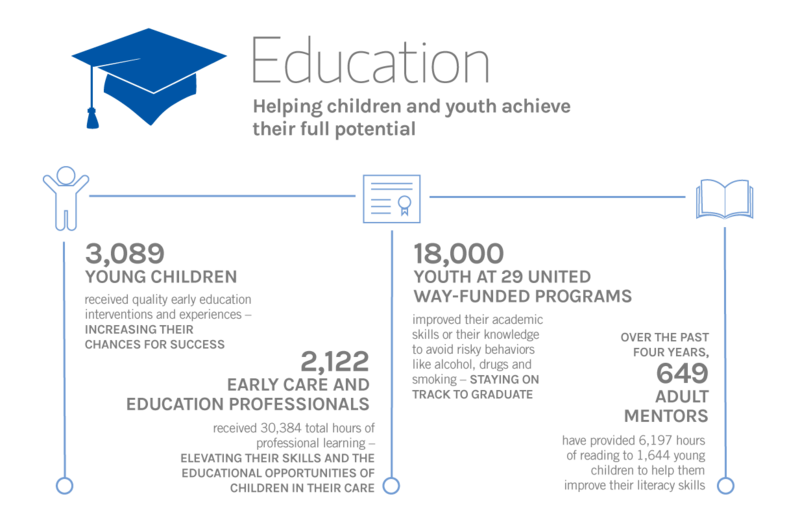 42 programs at United Way Impact Partner agencies that offer quality early care and education, out-of-school opportunities that improve academic performance, decision-making skills and reduce absenteeism and college prep support for high school students. In 2007, we opened our United Way Center for Excellence in Early Education, an innovative educational and professional learning initiative dedicated to elevating the quality of early care and education in Miami-Dade and beyond. 2,122 early care and education professionals improved their skills through 30,384 hours of professional learning through our United Way Center for Excellence in Early Education. Through a five-year, $22.5 million federal Early Head Start grant, we are reaching infants and toddlers in high-need communities, providing them with high quality early learning experiences. Pairing 200 adult volunteers with young children at prekindergarten classrooms to elevate their literacy skills, through our ReadingPals program. By working together, we can help high-promise youth become successful in their careers and agents for change in their community. Through the United Way Youth Institute, local youth, regardless of social economic status, develop leadership and service learning skills through mentorship, college exploration, learning about our three impact areas, and by implementing a local service learning project. Wouldn’t it be convenient to find access to school information or tips on health and wellness all under one roof? Welcome to United Way EDEN Place—Miami-Dade’s first educational family resource center. Discover the wide range of free services this center provides to the Overtown community and its impact on families and children.